Pluto, the solar system object everyone most loves to fight about. Scientists have spent 12 years arguing over how to classify Pluto, and a recently published paper offers a new — but surprisingly old — reason for restoring the object's planetary status. The new research focuses not on any qualities of celestial bodies themselves but on the past 200 years of scientific literature. 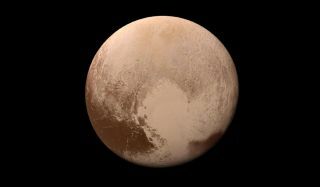 Four scientists trawled through astronomy papers published since 1802 looking for instances of the word planet used as defined by the controversial 2006 verdict from the International Astronomical Union (IAU) that reclassified Pluto as a dwarf planet. That group is responsible for handling astronomical nomenclature. The definition included the requirement that planets "clear" their orbit, making them the gravitational big shots in their neighborhoods. The new research focuses on how scientists over the past two centuries have discussed asteroids. This term was used interchangeably with "small planets" or even just "planets" up until the early 1950s, the investigators found. The authors argued that the IAU's definition, which the group voted on during its annual conference in 2006, attempts to override long historical usage in the community. "We recommend that, regarding planetary taxonomy, central bodies such as the IAU do not resort to voting to create the illusion of scientific consensus," the authors wrote. "The IAU has done damage to the public perception of science, which is a process free from centrally dictated authority, in its imposition of a definition of planet and the number of planets fitting that definition, which has been instilled in educational textbooks around the world on the basis of their authority." The definition agreed upon at that IAU meeting requires that an object meet three conditions to qualify as a planet: It must orbit the sun, it must be massive enough that its gravity pulls it more or less into a spherical shape, and it must clear the neighborhood around its orbit. Metzger and his co-authors argued that the third piece of that definition does not match historical usage by scientists and should be revoked. Brown's planet-murdering research partner, Konstantin Batygin, also of Caltech, echoed many other scientists in calling for an end to the bickering about terminology in favor of focusing on objects' quantitative characteristics, like mass and orbit. "These quantities are what's important, not what we call them," he wrote on Twitter. Metzger disagreed, arguing that terminology is important, especially for the most prestigious group of objects in our solar system. "The IAU definition would say that the fundamental object of planetary science, the planet, is supposed to be defined on the basis of a concept that nobody uses in their research," he said in the statement. "It would leave out the second-most complex, interesting planet in our solar system." His later comments made clear he would classify Earth as the most complex planet in our solar system. But it's hard to believe that a scientist focused on any of our other neighbors couldn't make a perfectly compelling reason for why it, rather than Pluto, deserves second-place billing — although Metzger judged Pluto as "more dynamic and alive than Mars." The research is described in an article published Aug. 29 in the journal Icarus.